Former UK Championship winners Neil Robertson and Ding Junhui made short work of their opening games to reach the second round at the York Barbican. Australian Robertson, winner of the event in 2013 and 2015, beat Welshman Kishan Hirani 6-2. The world No 10 produced five 50-plus breaks and a best of 110 in the fifth frame. Sheffield-based Chinese star Ding, like Robertson a two-time UK champion, coasted to a 6-1 victory over Poland’s Adam Stefanow. 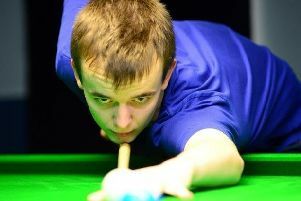 “The first round can be tricky here so I’m happy to get through,” said Robertson, who now meets Thepchaiya Un-Nooh or Jimmy White in the last 64. Ding last won the UK title in 2009, but the 31-year-old was rarely troubled yesterday, completing victory with breaks of 61, 55 and 66. Jack Lisowski was the first man to progress to the second round and did so in style as his 6-1 defeat of China’s Zhang Jiankang included two century breaks. Lisowski compiled scores of at least 50 in six of the seven frames, setting the trend with an 82 in the opener and making breaks of 120 and 115 in the second and penultimate frames respectively. 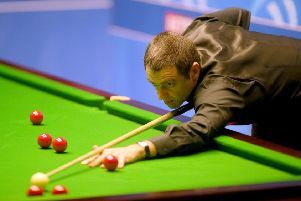 Former world champion Ken Doherty was also in fine form in his 6-2 victory over Chinese teenager Yuan Sijun. A break of 130 drew the Irishman level at 2-2 and he rattled off the next four frames with further scores of 50 and 82 in frames six and seven. There were also first-round wins for Chinese pair Zhou Yuelong and Luo Honghao. But there was no upset for Leeds potter Sanderson Lam, who lost 6-1 to the experienced Robert Milkins last night. Lam – the world No 103 – started well by winning the opening frame, but 42-year-old Robert Milkins, 74 places higher up in the world rankings, reeled off the next six frames to secure his second-round spot. Wednesday’s action sees Leeds’s Oliver Lines face Graeme Dott, Rotherham’s Ashley Carty plays David Gilbert, while Pickering’s Paul Davison tackles Stuart Carrington. On Thursday, the first round is completed when Sheffield’s Adam Duffy plays world champion Mark Williams, Leeds’s Peter Lines plays Rory McLeod, and York’s Ashley Hugill – now based in Sheffield – comes up against Hossein Vafael.